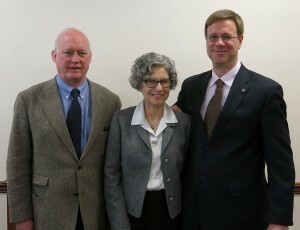 The Rare Book School Board of Directors held their annual meeting on Saturday, 30 January in New York City. This meeting marked the completion of the term of Alice Schreyer as Chair of the Board of Directors, and the Board approved the election of John Crichton as its new Chair, with Giovanni Favretti as Vice-Chair, Beppy Landrum Owen as Secretary, and Joan Friedman as Treasurer. John Crichton has been proprietor of The Brick Row Book Shop in San Francisco since 1983. John majored in journalism at the University of Kansas and began his career as a bookseller at Serendipity Books in Berkeley in 1980. He has served as the president of the Antiquarian Booksellers’ Association of America and of the Book Club of California, and as vice president of the Bibliographical Society of America. John has written about and given numerous talks on the antiquarian book trade and its history. The Board also voted to renew the appointments of members Florence Fearrington and James N. Green, and to approve the appointment of two new members: Chris Loker and Abby Smith Rumsey. Chris Loker is proprietor of the Children’s Book Gallery in San Francisco, and the author of children’s books and books about children’s literature, including One Hundred Books Famous in Children’s Literature. Abby Smith Rumsey is a writer and historian focusing on the creation, preservation, and use of the cultural record in all media; she has held positions at the University of Virginia, the Library of Congress, and the Council on Library and Information Resources. Her book When We Are No More: How Digital Memory is Shaping our Future, will be published next month by Bloomsbury. Joining Alice Schreyer in completing twelve years of service on the Board of Directors is Robert Gross, James L. and Shirley A. Draper Professor of Early American History (Emeritus) at the University of Connecticut. Bob has served as the Vice-Chair of the Board since 2008. The members of the Board expressed their deep gratitude to both Alice and Bob for their many years of loyal service.